When clicking the "Review Queues" icon in the top bar, one can see the sizes of each queue, but not how close to the queue limit it is. This information would be useful, however, because a queue being full degrades the operation of the site. For example, suggested edits are disabled altogether when the number of pending edits is 200. So it would help in my opinion if we showed this, and the users knew where to concentrate their effort. 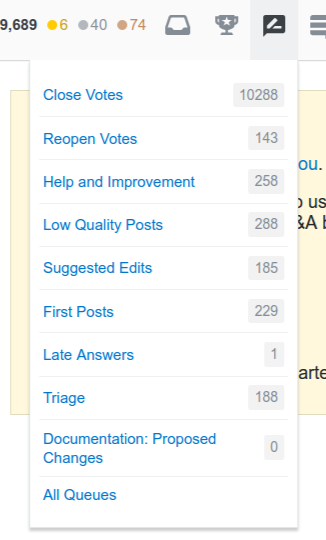 Browse other questions tagged discussion feature-request review new-nav top-bar .